Ferdi Porsche was born in northern Bohemia which at the time was part of the Austro-Hungarian empire. His parents were native Germans. He was conscripted in 1902 where he served as a chauffeur to Archduke Franz Ferdinand of Austria. He had left the military by the time the Archduke was assassinated sparking WWI. Ferdinand developed the first hybrid car in 1898, the Lohner-Porsche Mixte Hybrid. The modified carriage had a petrol engine which generated power for an electric motor. The car was designed for speed although performance was somewhat hampered by the 2 tonnes of lead acid batteries it carried. 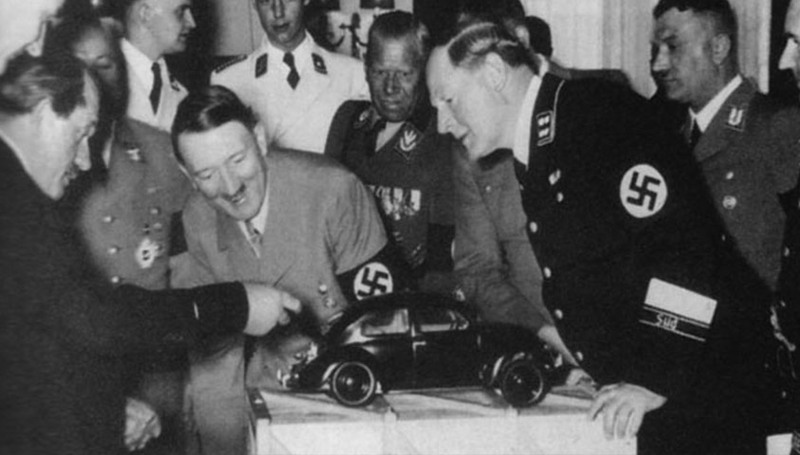 Everyone knows that Ferdinand Porsche designed the ‘People’s Car’ under Mr Hitler’s instructions in 1934. However, did you know that the first Beetle prototype was designed in Ferdi Porsche’s own house? Ferdinand Porsche was heavily involved with the development of the Auto Union cars. In 1932 Auto Union was formed from struggling manufacturers Audi, DKW, Horch and Wanderer with a chap called Klaus von Örtsen who enlisted Ferdi as a chief designer. Then in 1933 Herr Hitler announced a new racing programme to bolster the German automotive industry with 500,000 Reichsmarks for Mercedes Benz. Ferdi Porsche who (in showing quite poor taste in friends) had become close with Hitler convinced the Chancellor to split the fund 50-50 with the newly founded Auto Union team and the result were the famous Auto Union A-D series cars. In 1948, and following his fathers’ imprisonment for war crimes (something about being an SS member and engineering Nazi weapons of war) Ferry Porsche decided he wanted to build cars under the Porsche family name. The 356 was released in 1948 and was based on a Beetle chassis with a rear mounted engine that has of course featured on every 911 since. However, what is less well known is that the first car built, the prototype Porsche 64, also known as the Type 64 or Type 60K10, which is considered by many to be the first automobile from what was to become the Porsche company, and a true design precursor to the post-war production model. The model number comes from the fact that it was built mainly from design drawings for the Type-64 “record car”. The first 50 cars were built in Gmünd, Austria where Feri Porsche had moved the company to escape the allied bombings of Stuttgart. The 356 had a production run of almost 20 years from 1948 through to 1965. During this time Porsche produced some 76,000 cars with several different variants. See below for a helpful guide to the 356 model range. Dutch police used the Porsche 356 as a patrol car and Porsche built them an additional 10 cars a full year after they had ceased production. 356 “pre-A” : The very first 356s built. The earliest cars featured a split windscreen but by late 1952 the windscreen was a single piece, albeit bent. Initially only a 1,100cc engine was offered producing a staggering 30hp but by 1951 1,300cc and 1,500 cc engines were offered. The 356 Super was introduced in 1953 and the smallest capacity was dropped. 356 “A” October 1955 – September 1959 : Several engines were added for the “A”, including the venerable 100hp 1500cc four-cam Carrera motor. Other engines included the 1600cc pushrods and by 1959 all motors were 1600cc producing 115hp. Understeer was engineered into the chassis through suspension changes. Most notably from the outside, the windscreen was now curved instead of bent. Coupés and cabriolets were available as well as the iconic Speedster and Convertible D.
356B September 1959 – July 1963 : The 356B featured a “facelift” to the A but also had important performance developments including Porsche-designed annular disc brakes. Easy way to spot “B” is by looking for the squared off bonnet, petrol cap moved to the top of the front right wing and the twin grilles on the rear lid. As always a raft of engines were available. 356C July 1963 – 1965 : The last variant of the 356 introduced the C and SC models. The SC and Carrera 2 engines used twin-throat Solex carburetors, making 95 and 130 hp, respectively. Only coupes and cabriolets were offered. The most important change was the addition of conventional disc brakes to all 356 models. Like Lamborghini Porsche also produced tractors when they were merely a manufacturing company including this petrol powered tractor designed specifically for coffee farmers so the diesel fumes wouldn’t disrupt the flavour. This is a little complicated, so stay onboard. The 911 was born in 1963 as a direct development from the 356. At first Porsche called it the 901 which had been chosen to align with VW part numbers which at the time were using the 900 series for components. 901 was chosen as the first car produced after the 356. Porsche had designed and made a large run of the numbers 9,0,1 with gold plating to fit to the dashboard of the new model. However when they unveiled the car at the 1964 Paris Auto Salon, Peugeot threatened legal action claiming that the copyright of number-0-number belonged to them. As a simple fix, and to avoid the cost of producing a whole new set of numbers, Porsche simply did away with the “0” from 901 and ordered another batch of number 1s in gold plate and renamed it the 911. Some 82 cars had already been built under the 901 badge. Looking to buy or sell a porsche? The Classic Motor Hub has lots of experience in all breeds of Stutgart stallions. Visit our at Online Showroom to see what’s currently in stock.